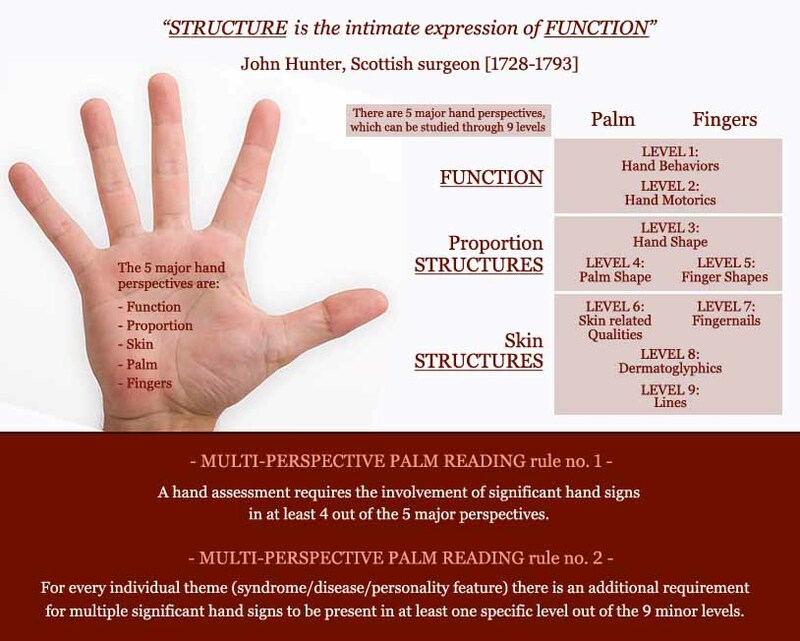 'Multi-Perspective Palm Reading' is a new advanced type hand reading, which demonstrates how scientific research results about the hand can be used for an assessment for specific psychological- and/or health themes. Because this new development can be recognized as a breakthrough in the field of hand reading 'as a science', I decided to present a brand new website - solely focussed & devoted to this fascinating branch of (diagnostic) 'palm reading'. - and the examples where according the 'DSM IV diagnostic and statistical manual of mental disorders', the hands can play a role in the diagnosis of various mental conditions & disorders. "A reliable hand-diagnosis is only possible when a pair of hands displays 'diagnostic clues' in MULTIPLE perspectives of the hand. According Multi-Perspective Palm Reading a person typically requires to have 'diagnostic clues' in at least 3 perspectives of his/her hands, before one can speak of a solid, specified hand-diagnosis." So far this Multi-Perspective Palm Reading website includes 12 pages, but in time every topic mentioned in the 'Multi-Perspective Palm Reading' vocabulary will be discussed at a new page featured with an overview of significant related studies to the topic. I hope you will enjoy reading more about this truely 'scientific' type of hand reading!!! Re: Discover Multi-Perspective Palm Reading! What a great resource! Wonderful idea! I hope that my new concept for making a 'hand diagnosis' (e.g. I have described that hand markers require to be observed at multiple of the 7 perspectives of the hand), will somehow also be adopted in the other hand reading systems more explicitely. Because so far, I think most books about hand reading that were published in the past decades have underlined 'the idea' that the art of hand reading can be specified to the ability to recognize meaningful combinations of characteristics in a pair of hands. But in so many books specific guidelines for finding such combinations have been missing. I think this is brilliant Martijn. You have worked really hard to put together all this research that you've been studying for so long. The format of your design for combining the various features (in various syndromes etc) is very clever. As you say, I've never seen anything presented like this with all the known info collected together to discuss the combinations. As you know, I've tested out some of the 'diagnostic markers' on some of the prints I've got of people with known conditions (eg Downs syndrome) and your method of combinations works very well as an indicator for these conditions! Very nice to hear that you have never seen anything like this before in the fields of hand reading. And I am also pleased to hear that you already tried to test some aspects of my method on multiple cases... with e.g. confirming results for Down's syndrome. [color=darkred]'Multi-Perspective Palm Reading' is a new advanced type hand reading, which demonstrates how scientific research results about the hand can be used for an assessment for specific psychological- and/or health themes. Congratulations Martijn! It is an amazing site, so full with excellent information. Such a great job... as usual from you! Very nice to hear that you like this new website! So far this new website includes 12 pages, but in time every topic mentioned in the 'Multi-Perspective Palm Reading' vocabulary will be discussed at a new page featured with an overview of significant related studies to the topic. Thanks Lynn. Really missed you all. Hello Martin Excellent . Good explanation. I always enjoy your reading . how to find 36 conditions with just 56 major hand signs! 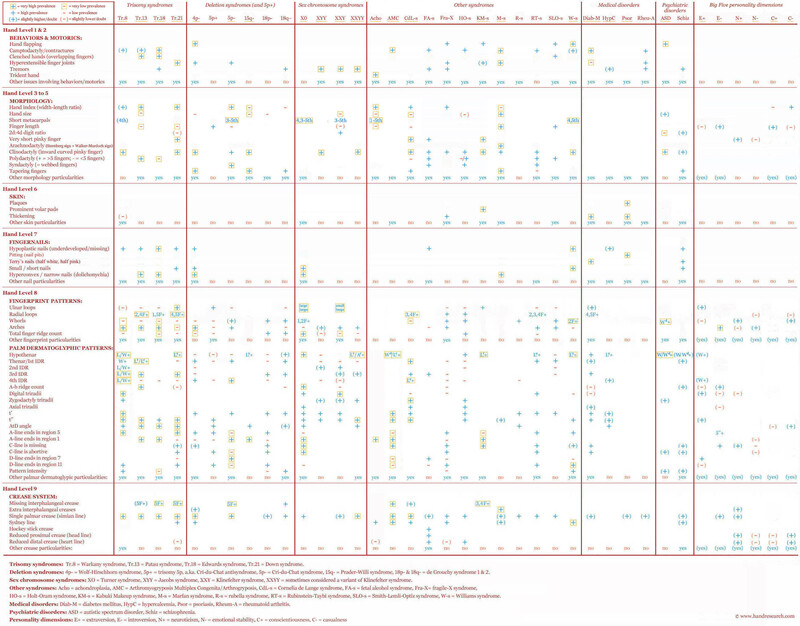 The 36 conditions summarized in the article (+ the table displayed below) include the two Big Five personality dimensions Extraversion (E) & Neuroticism (N), two psychiatric disorders: autistic spectrum disorders (ASD) & schizophrenia (Schizo) , four diseases including: diabetes mellitus (Diab-M), hypercalcemia (HypC), psoriasis (Psor) & rheumatoid arthritis (Rheu-A)... and 22 syndromes!!! I've been absent for two years now, and can' t remember that this scientific branch of palmistry was very succesful, and now you tell 36 conditions can be identified, that's incredible. Difference with traditional palmistry is likely that only patterns have been recognized, without attaching meaning to the individual components. I am curious to know whether those patterns can be explained by traditional palmistry. Good question + good thinking! But your question is far from easy to be answered... because in the fields of palmistry a range of different concepts is often attached to a single hand sign. So, even though a single palmist often tends to claim to attach a specific meaning to a hand sign... another palmist may attach a different meaning. This is also illustrated by the fact that one can sometimes find conflicting meanings when palmistry books are being compared with each other. Still, meanings for hand signs don't just fall from the sky, but are the result of symbolic thinking. Though in the case of the minor lines admittedly the meanings look somewhat arbitrary, but those are not part of the scientific handreading. I hope that the scientific approach will help to clarify some meanings. I am curious what the palmistry profs have to say about this. Maybe you can describe an example in order to illustrate what you exactly have in mind regarding 'symbolic thinking'. The shape of the hand gives insight into the (latent?) shape of the character of the person. An earth shaped hand has a square palm, and the square symbolizes earth because of the four directions, and because a square offers the most stable foundation. The fingers denote the mental faculties, and are to the palm as heaven is to earth, because the palm is solid, and the fingers are moving, like the heavenly bodies. So the earth shaped hand has small fingers, so there is less heaven quality than with long fingers. The skin texture gives insight in how we receive things, like the skin receives its stimuli. The person with a gross, rough skin (earth) will be literally thick skinned, and insensitive. Of the fingers, the thumb represents the will, because it is most free to move, and most essential to the hand, as the free will is most essential to being human. This can go on and on. Admittedly, sometimes alternative meanings can be attached, and I hope that the scientific palmistry will help to sift the wheat from the chaff. For example, in western palmistry the left hand symbolizes the home and latency, and the right hand what has been developed. But in indian palmistry, the right hand is for the male client, and the left hand for the female client. First of all, thanks for answering my question nuttyprofessor. Unfortunately, I perceive your answer not to include much reference in terms of specific behavior; only your example involving 'thick skin' being 'insensitive' could serve for that. Your references to a square palm & short fingers in terms of 'heaven''and 'earth' are not very specific on how to recognize such features, nor is the reference to a 'stable foundation' - by the way, the term 'square palm' is of ambiguous nature because palms can at best only approach a square but the variations are endless, etc. By the way, if 'free will' is essential to being human... one could argue that everybody should have it. This type of language can hardly serve to represent the basis of a science or research study; it's more like the language that could fit well in a religious belief system describing things with sort of a free association... because after all, the term 'heaven' hardly has any specific meaning beyond the context of religion. I do realise that in time such associations have been copied by authors from each other and sort of became part of the palmistry-folklore. In a way one could say that... nearly everything in palmistry became falling from the sky, but the associations presented for individual hands signs usually can be recognized to represent a very wide spectrum of behavior when the works of multiple authors are being taken in consideration. Part of the fundamental problem that I perceive is also that palmists often confirm that is it essential to combine hand signs... but meanwhile palmists have continued the efforts to attach specific meaning to individual hand signs. This is like a snake biting it's own tail. I can only hope that you will appreciate my observations. The performance of a team is based both on the individual quality of respective positions, and the quality of the teamwork. I see no reason, why this could not be so for palmistry. The problem is that no professional handreader these days will pass the test of scientific scrutiny. Reason may be, as stated by Fincham, that people often compensate for the traits shown in the hand. If this is so, than admittedly the objective verifiability has been lost. I don't know to what degree, but sadly this gives professional palmists free reign to use their storytelling faculty, which will happen more often than is desirable. To me personally, the criterium would be the character of the palmist him/herself, though this will be not easy to get a picture of as we don't know their private lifes. I see here two different types of palmistry. The modern handreading, which is all about an objective diagnosis, and the traditional handreading which is about therapeutic interaction between reader and client. Palmistry as soothsaying should be denounced, as it is the domain of quacks.